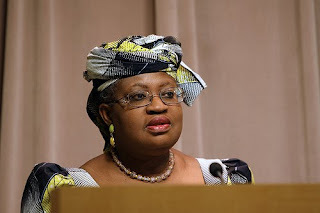 It has come to our notice that a well coordinated campaign of calumny against the Coordinating Minister for the Economy, Dr Ngozi Okonjo- Iweala, founded on outright lies and despicable distortions is being executed by cowardly persons hiding behind the ongoing controversy over the government’s decision to deregulate the petroleum sector. For obvious reasons, the faceless campaigners have elected to tell their lies online because the normal journalistic principles of facts and balanced reporting are generally absent there. For instance, we have received numerous enquiries regarding an alleged threat by the Coordinating Minister to resign if the government goes back on its decision to end the fuel subsidies. The threat was supposedly made during the emergency Federal Executive Council meeting which held yesterday. This speculation, like numerous others is absolutely false. DR OKONJO-IWEALA WAS NOT AT THE MEETING BECAUSE SHE WAS OUT OF THE COUNTRY WHEN IT WAS GOING ON. In other words, they are saying that she made a threat at a meeting that she did not attend. She made no such threat physically or through any other means. She had no reason to. The agenda behind the alleged threat and similar stories is obvious: to inspire public hatred and odium against her person by manipulating public opinion so that she is seen as the sole person pushing for the removal of subsidies. Their calculation is that Nigerians are so angry and so gullible that they will believe anything if the lies are supported with manufactured “facts”. But we believe that fair minded Nigerians are not fools. It is clear that governments and certainly the Jonathan administration do not work in the manner that the peddlers of falsehood are saying. It is not only naive but also highly disrespectful to the President and the government as a whole to suggest that the entire decision making machinery of government is the sole preserve of any official. We urge the media and the Nigerian public to ignore the antics of people who obviously believe that Nigerians are fools. For the avoidance of doubt, Dr Okonjo-Iweala supports the decision on fuel subsidy removal because she believes that ending the subsidies will drastically reduce corruption in the downstream sector. Deregulation will also help to end the waivers enjoyed by powerful cabals at the expense of the Nigerian people. In addition, the vast majority of Nigerians will also gain as the proceeds will be redirected into safety nets, other identifiable social interventions as well as provision of sorely needed infrastructure projects nationwide. How will it reduce corruption? It's easy for us this people to say what they presume will happen when it doesn't really affect them. They've got tons of $$ rolling in and can afford fuel even if the price is quadrupled. How will the subsidy reduce something that has come to stay in Nigeria?